Somewhere in my youth or childhood…if it were me singing that song, I could’ve added ‘or past life.’ I definitely felt that I must’ve done something right as last week, everything miraculously fell into place, allowing me to go to Mayapur for four weeks in March. I thought I was unbelievably fortunate to be in Vrindavan for Kartik. It enlivened me like nothing ever before, and has been in my thoughts ever since. Returning home, I never could have imagined that I would be getting the chance to go back to the holy dham within a matter of months. I can’t quite fathom what I might’ve done to be so blessed, but whatever it was, I am grateful. It crosses my mind that maybe I’m not cashing in on pious credit. Perhaps my only qualification to be doing so much travelling, is my youth and relatively short and travel-friendly academic year. But then I realised that it’s probably down to none of these things. The real reason must be that Srila Prabhupada and Lord Nityananda are showering some wholly undeserved mercy upon me. I pray that I will never take this for granted. I pray that I will never foolishly think that I can visit these holy places at my own whim – and that I will never underestimate their spiritual potency. This opportunity is definitely a precious gift – I pray to make the most of it. Investigating the life of Jesus….in Vrindavan? I was really hoping that this program, aired on Channel 4 on Christmas Day here in England, would get put on the internet. It was quite amazing to see such a broadminded and thoughtful program on Christmas day – normally saturated with movies, sitcom specials and carol services. What was even more interesting, was to see the first twenty minutes, filmed in Vrindavan. I never thought I’d see Radhakunda on primetime mainstream national television! It’s well worth watching the whole thing if you have time – the presenter has some interesting viewpoints – some, maybe a bit far reaching, but it’s quite refreshing overall. Also, should my dad say I stole his post – you can see his original one here. Of course, moving through a drenched January into a bleak February, spring is quite far from sight. Inside though, early bulbs of ‘paperwhite’ and ‘tete a tete’ narcissus have been blossoming in my room. They have the most wonderful delicate fragrance that fills the entire upstairs floor of the house. So many are growing that I can offer them to my deities every day in bunches; a good thing since they wilt after a few hours. Early in the morning, a mild breeze would carry the aroma of the parijata flower, and Krsna would smell it just after rising from bed. Due to this aroma, the honeybees would begin their humming vibration, and the birds also would begin their sweet chirping sounds. 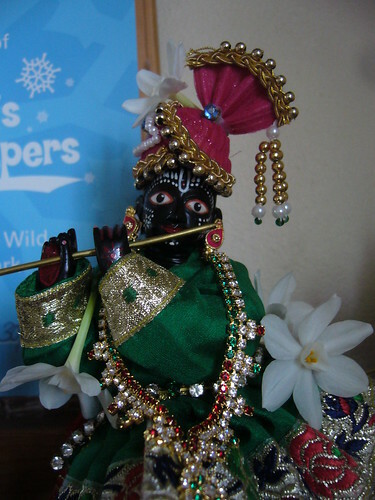 All together it would sound like the singing of professional chanters engaged in offering prayers to Krsna. A the start of this new year, I am praying to be resolute. Resolute means to be ‘marked by firm determination’, something often very elusive, for me at least. There are so many things in my life which have great importance, yet I am not resolute in my determination to dedicate quality time and attention to them. Whether it’s my spiritual life – chanting rounds, reading; my education – music, dance, university work; even the other creative activities that I love – all are withering without my continued, focused attention. It is painful to face your own faults. Everyone wants to feel that they are really doing their best in life. But I know I’m not, and I can’t pretend to be. 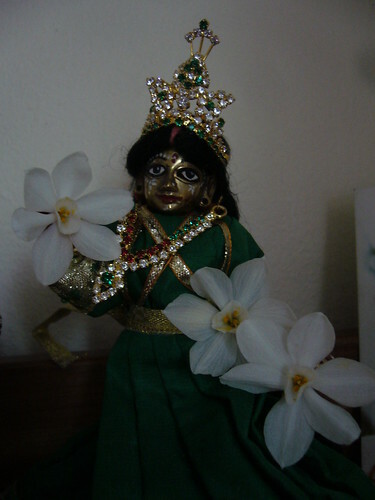 Even if I could fool everyone else, it’s impossible to fool Krishna. 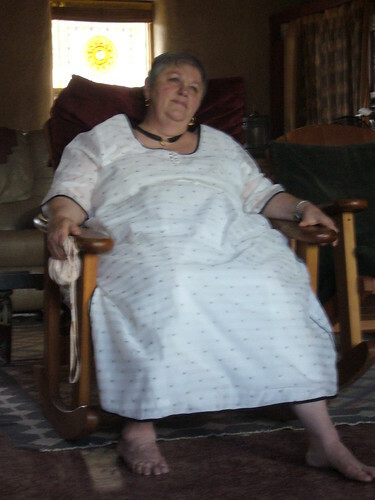 So at the start of 2008, I pray to be resolute. 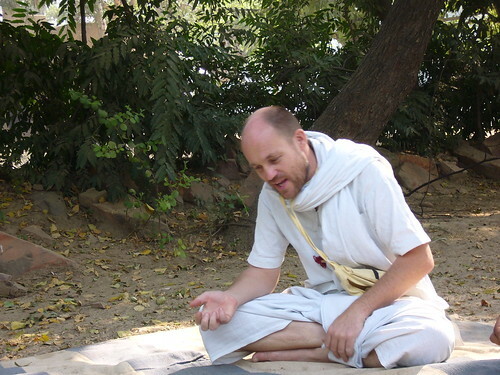 This devotee (I can’t remember his name) – in charge of the ISKCON Goshalla in Vrindavan. His dedication is admirable, striving to maintain and build something important but often overlooked. 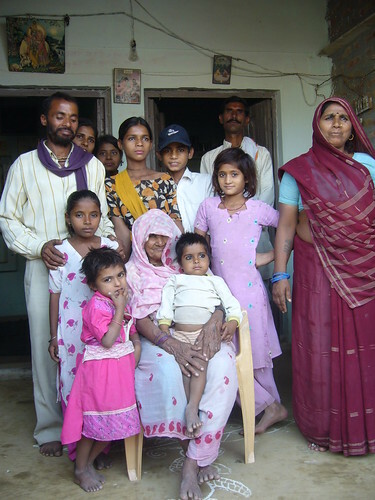 In Belvan, Vrindavan, we shared an afternoon with this wonderful family. Seeing the simplicity of their life, but the joy with which they lived it and their sincere hospitality to us humbled me. 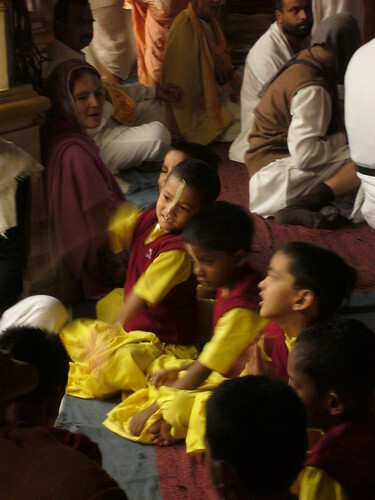 Watching the youngest gurukula boys just before the morning program in the Krishna Balarama temple, Vrindavan. They sang in kirtan so enthusiastically, loudly shouting ‘Haribol! Haribol!’. Surrounded by the potent atmosphere of Vraja, they reminded me of the cowherd boys and how enthusiastically they must be singing about Krishna always. I was blessed to be travelling with forty talented and inspiring friends this summer. Over almost two months, I learnt something valuable from each one. 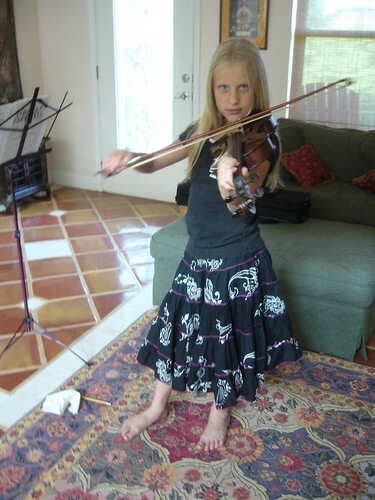 In LA, I had the chance to re-connect with Guru Nistha, who studies Hindustani violin – we excitedly got out our violins and spent a wonderful hour under a tree, comparing notes and playing together. 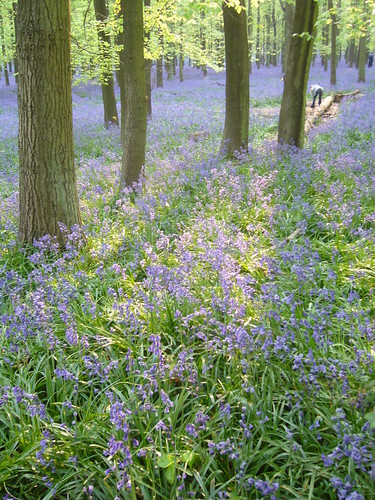 As always, my friends here in England inspire me more with every year. 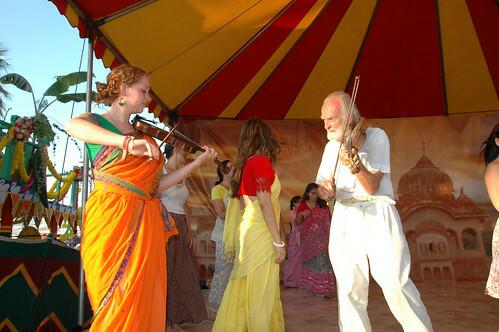 We are a family, and this year has been more special than ever as we have grown together in commitment to coming together and performing kirtan, doing service – we are even hatching new plans as this new year starts to try and be more involved in preaching. Sarva inspires me for too many reasons to count. 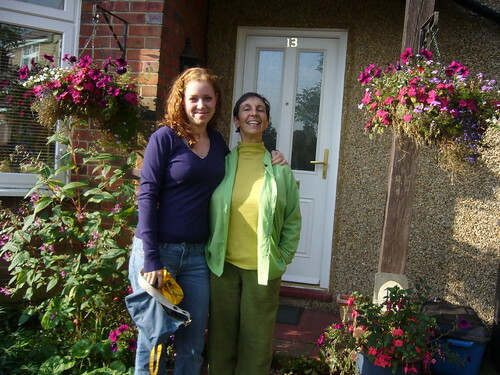 I was lucky to spend two days with her, as she lives in Australia right now. 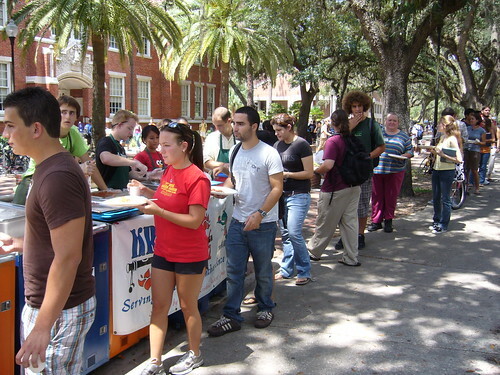 I was amazed to see the number of people, enthusiastically lining up to eat prasadam at the Krishna Lunch program, University of Florida. It is incredible to see how something that starts so small, can become something so successful – they now serve five days a week I think and serve out thousands of plates to the students who all give donations. I really realised the potency that prasadam has through the seeing the enthusiasm of everyone present. 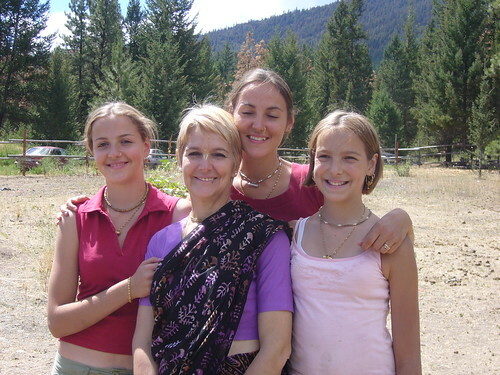 I was over joyed to visit Yamuna devi (top) and Dina Tarine (bottom) in their ashram in Saranagati, B.C. I have only ever been there for two days total, but those days have fuelled me in so many ways. 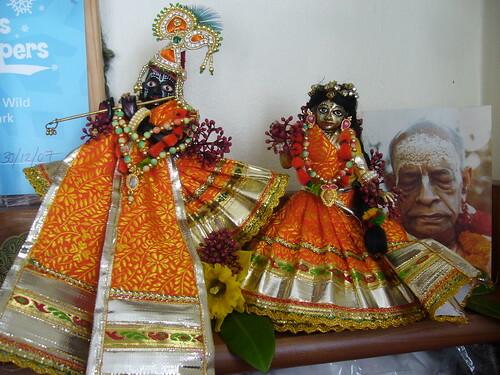 Being in their company is special and priceless – from attending their morning program for their deities -Radha Banabihari, to cooking with them – everything they do is driven by sincere devotion to Krishna. So rare. I was equally inspired to visit Yadubara and Visakha prabhus. I am always quite awestruck to think of their incredible combined effort during the time that Srila Prabhupada was present – photographing and filming his activities for the eternal benefit of the entire world. They are wonderful artists and they continue to produce beautiful films, books and other media on Krishna consciousness. In Saranagati, Radha (second from right) was our guide, taking us around the valley to meet everyone – at one point we got to meet her family, who were loving, welcoming and inspired me in their way of life. Saranagati has only generator run electricity and can be an austere place to live (everyone there had a different bear encounter story to tell) – but they live simply and sweetly and seeing them, I felt convinced that this in this simplicity, it is easier to be Krishna conscious. I was so lucky to travel all summer with Anapayini, who is one of the most beautiful, sincere and gifted people I know. Being with her rekindled my enthusiasm and belief in the importance of cultivating classical art forms like dance and music as a wonderful way of glorifying and serving Krishna. 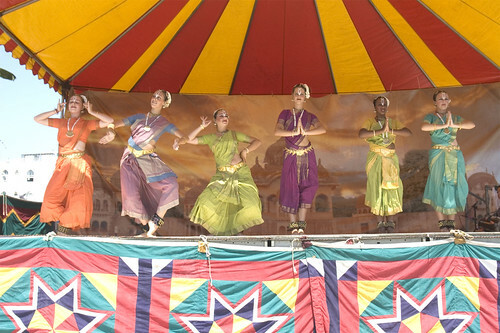 She runs her own dance school – Bhaktikalayam in Alachua, Florida and together with her equally inspiring senior students, we choreographed a performance together for Janmashtami. Every moment with her was truly a blessing. 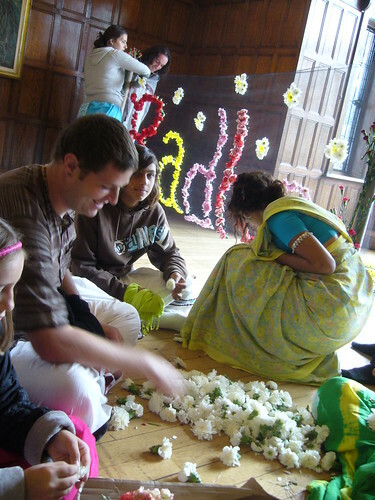 Performing with the Bhaktikalalayam girls at LA Rathayatra, L-R, me, Prtha, Sita, Jahnavi, Kalindi, Nadia – ‘The Nine Processes of Devotional Service’. 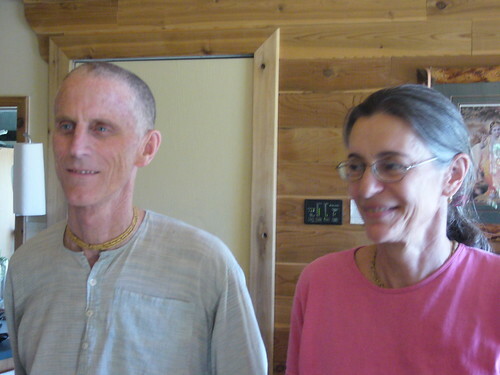 These two people – Jaya Radhe and Manu, inspire me unbelievably. Their determination, sacrifice, effort and wonderful vision in motivating and engaging devotee youth – whether on the annual Krishna Culture Festival Tour, or in other projects throughout the year is something that I aspire to develop. They are extremely special souls. 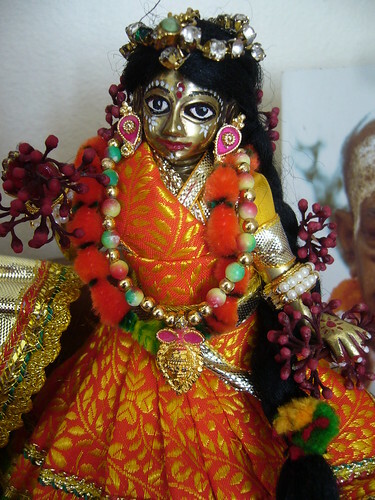 As ever, last year the beauty of Krsna’s creation and his presence everywhere inspired me almost daily. Somehow I had the good fortune to be somewhat synchronised in my movements across the globe with Radhanath Swami. First in various places across North America on the bus tour, then in Alachua, Florida, and finally in England! I had never really spoken to him before, although I had seen him many times. 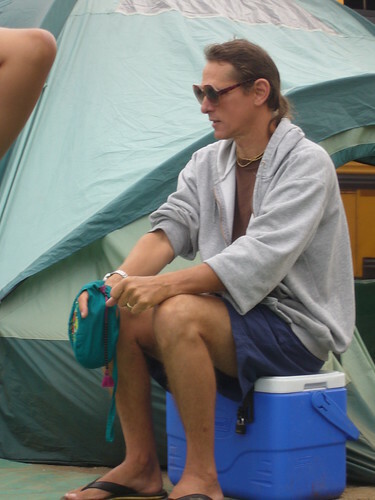 His kindness, sincerity, devotion and clarity of purpose left a great impression on me and I was equally impressed to see how he took time to connect with everyone, whether he knew them or not. When he was in England, he attended our weekly Friday ‘gurukuli bhajans’ evening and afterwards sat, speaking to each of us one by one. I saw some of the younger boys sitting with him, their faces completely lit up – and normally they aren’t so enthusiastic. It was wonderful to see. Undoubtedly, my most inspiring experience last year, has to be visiting Vrindavan. So. I have do something with all this inspiration. 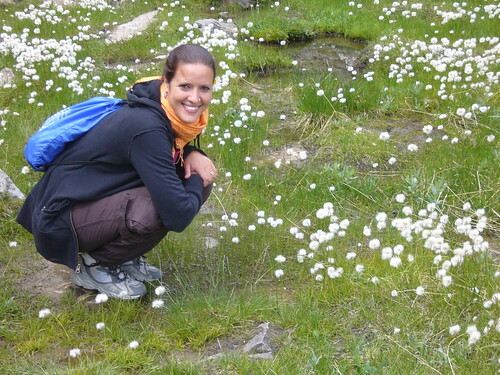 What use is being inspired if it does not become the catalyst for positive action? I have to be resolute. This is my resolution. Thyagaraja had some visitors, but there was no food to serve them. As usual he prayed to Lord Rama. Soon there appeared at his doorstep, a man and his wife accompanied by their servant. The couple said that they were carrying some foodstuffs with them but wanted a place to cook since they were travelling. Thyagaraja graciously invited them. Soon the Lady and the Servant had cooked enough food for the whole party and took leave of Thyagaraja. Later he realised that Lord Rama had himself come to his house accompanied by Sita and Hanuman. In a burst of gratitude, he composed Bhavanutha. Below are two translations of the songs I’ve been learning. Reading the lyrics is never as good as hearing the song itself though – and I imagine, being able to understand the lyrics in their original language (Telugu) is even better. O Chief of Raghus! There is no one else to bestow affection on me and protect me other than you, Lord of the Universe! Most exalted among men! Who else would have donated Lanka to Vibheeshana to the delight and appreciation of Indra and others? Who else would have followed Visvaamitra from Ayodhya and protected the sacrifice he was performing from being desecrated by Maaricha and others? Who else could have killed the indomitable Vaali with just a simple arrow and croned Sugriva as the king of Kishkinda? Please hold the hand of innocent Tyagaraja to enable him cross this ocean of worldly problems. O Rama! Adored by Brahma! Do come and sport in my heart and be rid of your exhaustion. One who helps to cross the ocean of Samsara! O Worshipped by Brahma, one who is born from the Lotus! Loved by Anjaneya! At your sudden, unexpected arrival, I felt embarrassed. I could not receive you in the royal style befitting you and make offerings to match. But you set me at rest by cheerfully accepting whatever I could extend, and what is more, assured me that you would take care of me and proclaim to the world that I belong to you. 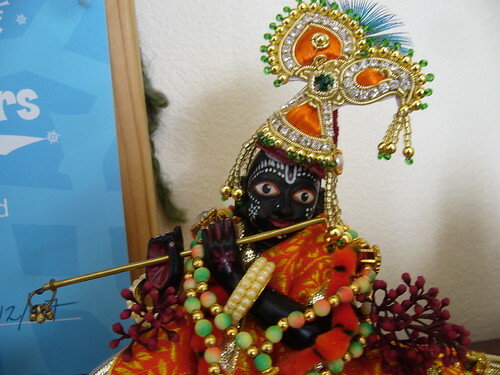 Aren’t you the Lord protecting Tyagaraja? 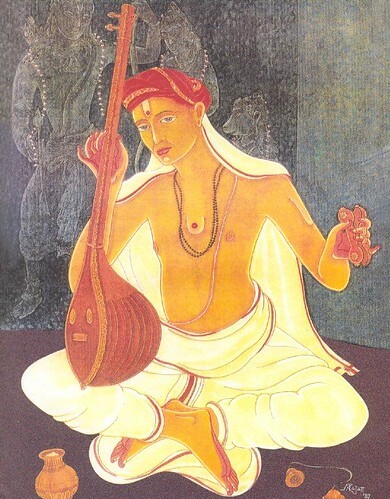 To this day, thousands of musicians throng the sanctum sanctorum of Thyagaraja at Tiruvaiyaru on the banks of the river Kaveri to offer their musical tributes to the great composer; organising huge concerts in which hundreds sing and play his compositions together, as one giant orchestra. He is believed to have reached the abode of Lord Rama in the year 1847. Since then, the ‘Thyagaraja Aradhana (festival)’ has been commemorated every year. My deities today. 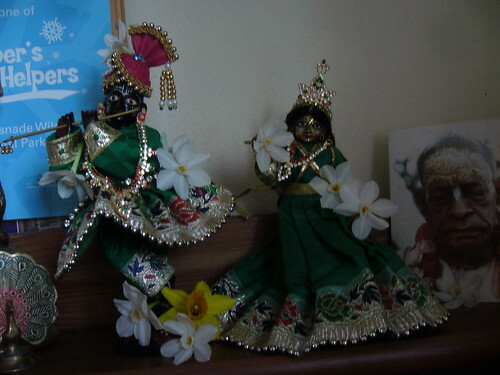 I bought Krsna’s beautiful crown in Vrindavan, and found his peacock feather at the foot of Govardhan Hill. I am liking very much! On Monday I finished all of my coursework assignments and handed them in. One of them was a short essay on the dialect ‘Indian English’ and it’s context within Britain. My teacher reacted with interest when I told her I wanted to write on this topic, instead of a regular British regional dialect. Devotees must seem so unusual to ‘regular people’. I remember in my first Linguistics class ever, the professor went around the room, asking people what language knowledge they had. French, Spanish, Polish, German – they all went up on the board; but only one person wrote up ‘some Sanskrit and other Indian languages’. And that person was probably the least expected person to write that – me, white with red hair, looking as Anglo-Celtic as you can get. 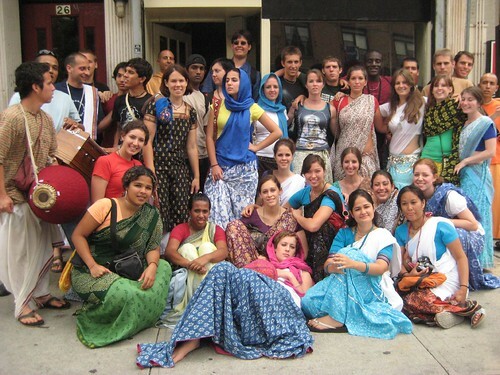 I think that growing up in ISKCON is what first sparked my interest in linguistics. 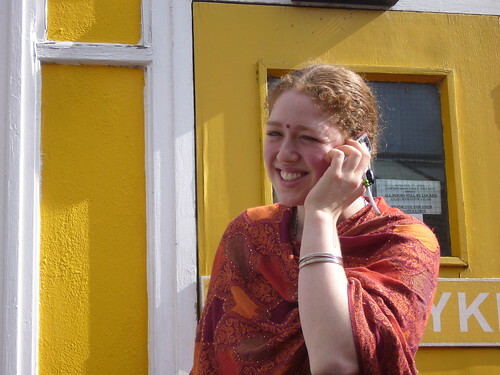 Being part of a culture with, first of all, such an international membership (and therefore potential contact with many different languages) and secondly, central focus on written texts and culture in several Indian languages, creates such an interesting breeding ground for language creation and growth. 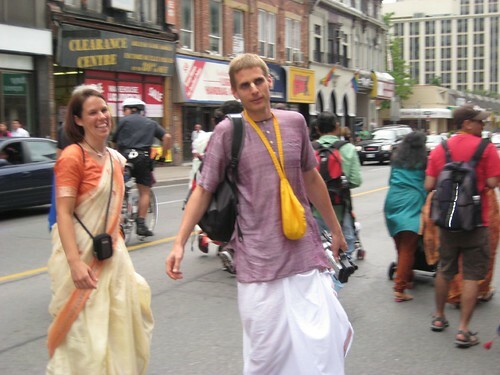 What to speak of the fact that ISKCON, as a society, is still very new. As part of my university course, I’d love to do further studies in this particular vein. It’s so interesting to observe how my generation are responding to the language they’ve been brought up with and changing things – making new meaning. 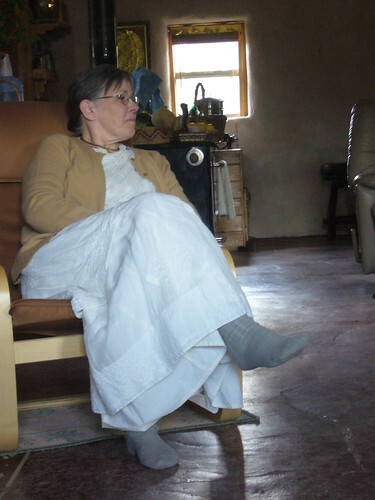 In turn, the older generation respond to this, either adopting the changes, or resisting them. Maybe it could be a book – ‘How The Whompers Got Their Name: Linguistic Oddity in a New Vaishnava Society’. Haha. I’m not pretending to be a great scholar – it’s a pretty standard essay (but interesting, I think).